In the early 1990s, the U.S. DOT began focusing on encouraging cycling and walking, and the policy has paid off. 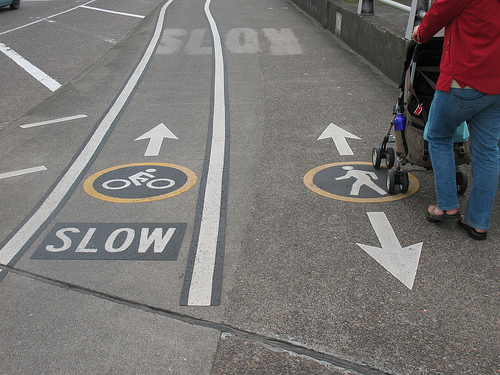 Above: Bike and pedestrian lanes on Hawthorne Bridge in Portland, Oregon. Photo via Mark Stosberg. Hurray! Yesterday brought great news for sustainable transportation advocates. 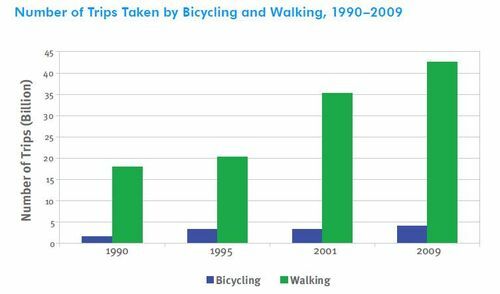 On June 16, the Federal Highway Administration released its National Biking and Walking Study, analyzing trends in transportation over the past 20 years. 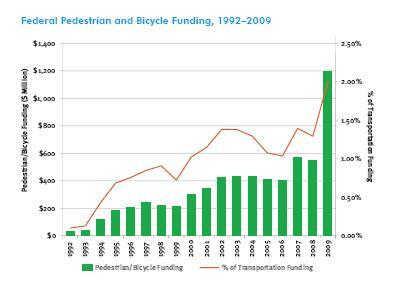 Turns out, there is more federal funding for pedestrian and cycling projects, there are less fatalities, and, overall, there are more trips taken by bike or foot. The report is the third update of a study originally published in 1994 with a long-term goal of reducing road fatalities and encouraging more people to walk or cycle. Between 1990 and 2009, the number of trips taken on foot more than doubled from 18 billion to 42.5 billion. And bike trips increased from 1.7 billion to 4 billion.